Photos of each stage are on OneDrive - click on the photos for the link. 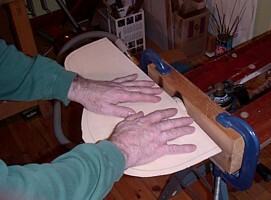 The significant difference in the construction of this guitar is the heat bent dome in the soundboard - sometimes called the "pliage" (pleat / fold in French). 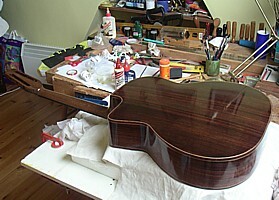 The guitar was built in a similar way to the first Maccaferri, the main difference being the heat bent top (pliage). Full details of the heat bent pliage construction. Soundboard - European Spruce, 2.2mm thick . 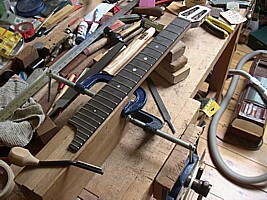 Neck - American Walnut, scale length 640mm. A slim, modern design and using the Cumpiano bolted mortise & tenon neck / body joint. 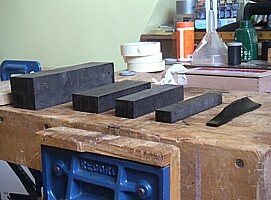 Binding - Rosewood - much easier to heat bend than the ebony bindings used last time. Finish - French polished with transparent Shellac. Tuners - enclosed gold plated Schaller. 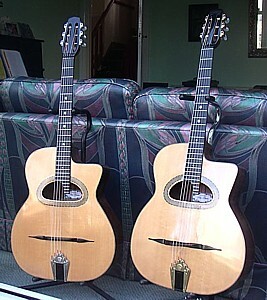 Sound - brighter, louder and more responsive than the first Maccaferri guitar. I am guessing that this is due to the heat bent top making the soundboard stiffer. A bridge making contact all along its base sounds mellower. A bridge with less mass sounds brighter. There is a tonal difference between ebony and rosewood. 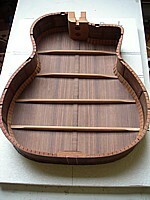 The guitar was constructed over a period of 2 years.